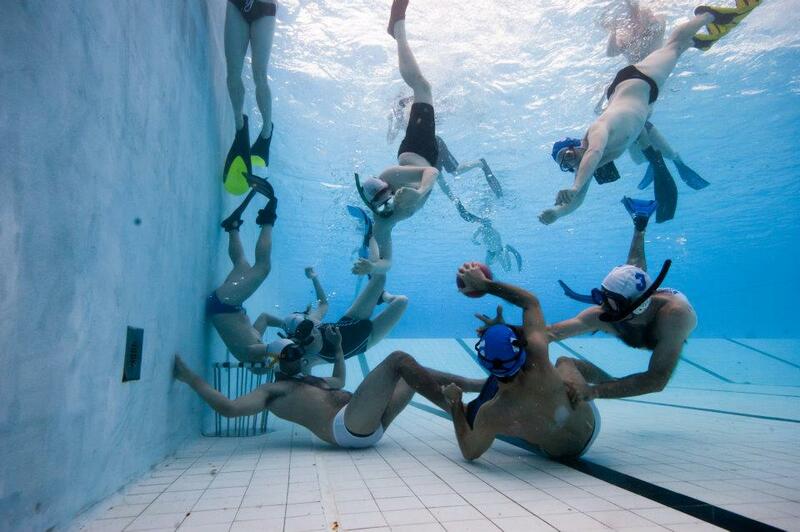 Underwater Rugby began more than 30 years ago in Germany and is popular in areas of Europe and Colombia.It is also played in Singapore, North America, South Africa and New Zealand. It began in Australia in 2007 in NSW and has been growing ever since, to the point there are now 7 teams in Australia – Sydney, Brisbane, Canberra, Tasmania, Adelaide, Perth and Victoria! Internationally, there are underwater rugby World and European Championships administered by CMAS. Closer to home, we have the annual Pan Pacific Cup which is played between teams from Australia, Singapore and New Zealand. The Australian National Championships are held every year in a different state capital. In a pool 12-18 m long and 3.5 - 5 m deep, two baskets are placed at either end, with six players on each team. There are three positions on each team: forward, back and goalie. Players play in pairs, with one partner breathing on the surface while the other is playing underwater, until it's time to swap. The ball is filled with salt water and so is negatively buoyant, travelling a few metres before sinking to the ground. A goal is scored by getting the ball in the opposing team’s basket. Contact is part of the game, and is usually grabbing and wrestling the person carrying the ball. In order to score a goal, you will usually have to physically move the goalie from the basket.